1) Approximately how many eye injuries are there each year in America? The large number of injuries underscores the importance of using eye protection to lower your risk. Of those 2.5 million injuries, more than half happen in or near the home—more than injuries at work and school combined. 2) What is the most common place that eye injuries occur? According to a recent report by the American Academy of Ophthalmology and the American Society of Ocular Trauma, the most common place of injury was in the yard or garden. They also found that one in four eye injuries that occurred in or near the home were due to home repair or the use of power tools. This is why using proper eye protection at home is so important. 3) What are some common eye injuries that safety eyewear provide protection for? Some eye injuries can result in permanent vision loss. Painful corneal abrasions can be caused by a foreign object “scratching” the cornea. Chemical splashes can easily occur in the house or at the job. Read labels carefully (before you open the bottle) and see if eye protection is needed. Chemicals can also cause eye irritation, such as the eye irritation experienced when using products like ammonia. Remember never mix any cleaning or household chemicals. Punctures can be caused by any number of flying objects or when wearing regular glasses or sunglasses that are not designed for safety use. 4) I can always just use regular glasses or sunglasses to protect my eyes. According to Prevent Blindness America, regular eyeglasses do not always provide enough protection. In fact, they may even cause more injury upon impact by a flying object or debris. Look for safety glasses or goggles that will fit over your regular glasses, if you wear prescription glasses or sunglasses. 5)	A “minor” eye injury is nothing to worry about? According to National Institute for Occupational Safety and Health (NIOSH), even “minor” eye injuries can cause life-long vision problems and suffering. For example, a simple scratch from a piece of sawdust, cement, or drywall can cause corneal erosion that is recurrently painful. In fact, you should seek medical care immediately if you have injured your eye. 6)Which of the following are good ideas for eye safety? A) Read and follow all product instructions and warnings. C) Use good lighting and handrails for safety on stairs. Prevent Blindness America recommends, reading and following all product instructions and warnings, especially for products that may contain harsh or toxic chemicals, like some home cleaning products, pesticides, fertilizers, etc. These should all be stored in a safe place. Thoroughly look for debris and remove it from the lawn before mowing, put on your safety glasses, then clear the area of any bystanders or make sure they wear eye protection. Keep your house and its surroundings well lit for safety, especially indoor and outdoor stairs. This can help prevent falls and eye injuries. 7) I may need more than one pair of eye protection. While you want to choose well made and properly fitting eye protection when doing any activity that might put the eyes at risk, different activities can call for different types of protection. For example, Prevent Blindness America recommends wearing safety glasses with side protection or dust goggles to protect against flying particles, and chemical goggles to guard against exposure to harsh or toxic household chemicals, fertilizers, and pesticides. Welding or brazing, of course, requires special safety goggles, shields, or helmets. Consult your equipment instruction or supplier for the proper protection. 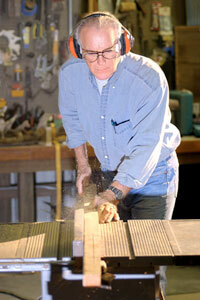 8) What type of common construction and home improvement work would require safety eyewear with side protection? The National Institute for Occupational Safety and Health (NIOSH) recommends always wearing properly fitted eye protective gear, such as safety glasses with side protection/shields, when doing work that may produce particles or slivers from materials like wood, metal, plastic, cement, and drywall dust. 9) I’m the only one who needs to wear glasses if I’m working with power tools at home or in the yard. Make sure any bystanders have protection, too. Flying debris is unpredictable and can project farther than you might anticipate. If debris starts to fly, you’ll be glad that everyone has protection—or that you’ve already cleared the area of bystanders. 10) What are some precautions you should take before removing your eye protection? A) Make sure all power tools and machinery are off. B) Check the area for any debris hazards, including still falling debris or remaining airborne eye irritants. C) Brush, shake, or vacuum dust and debris from hair, forehead, and hats. D) Do not rub eyes with dirty hands or clothing. NIOSH recommends making sure there are no threats to eye safety before removing eye protection, i.e., safety glasses, goggles, face shields, etc. Often when the job is done you’re ready to quickly get out of all your protective gear, but take the time to do one last safety check before you remove your eye protection. you must have forgotten your glasses or maybe you just don’t trust so many “All of the above” answers. Make sure you think safety first when it comes to your eyes. 4 to 7 – Well done. You have been paying attention. Remember to always err on the side of safety when it comes to your eyes. 8 to 10 – Alright! You know your stuff! Keep your eyes safe and share your knowledge with a friend. That's how quickly it can happen - in the blink of an eye. You have no time to react. That's why it's so important to protect your eyes from harm. The best ways to prevent injury to the eye is to always wear the appropriate eye protection. The Bureau of Labor Statistics reports that approximately three out of every five workers injured were either not wearing eye protection at the time of the accident or wearing the wrong kind of eye protection for the job. To be effective, eyewear must fit properly and be effectively designed to protect the eyes based on the activity being performed. The Occupational Safety Health Administration (OSHA) has standards that require employers to provide their workers with the appropriate eye protection. The eyes also need to be protected from prolonged sun exposure, so have sunglasses with UV protection at hand. If you’re putting on sunscreen, you should also be wearing sunglasses with UV protection. Vision is a gift. Make the extra effort to protect it.